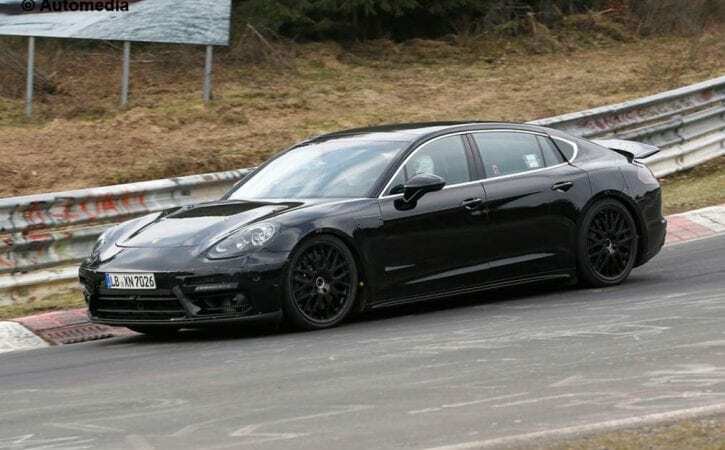 This is the best view yet of Porsche’s 2016 Panamera, with this prototype spied with minimal disguise on-the-limit around the Nurburgring racetrack. We’ve seen various test mules of the Stuttgart saloon, but these images reveal the extent of the bodywork changes Porsche has made. With its long bonnet and a lower, swooping roofline, the next Panamera appears more rakish than the ungainly current model. From the side it’s definitely more like a four-door coupe than at present, and the back view shows accentuated ‘hips’ styled like the wide-bodied variant of the 911 sports car. Trademark four-point LED headlights bring the big saloon into line with the Macan and Cayenne SUVs. Porsche design boss Matthias Muller has previously gone on record as a critic of the current Panamera’s divisive design, saying it “could be better”. This generation has apparently been penned to right that car’s wrongs, and hopefully improve the model’s image. The Panamera also retains the active rear wing that rises electronically at speed to improve downforce. It appears larger than before, hinting at aerodynamic improvements, althought it’s unclear which models in the range will receive it. We haven’t seen images of the cabin yet, but Porsche will likely move towards touchscreen tech, ditching the button-heavy layout that we’ve seen in the 2015 Cayenne and creating something similar to the centre console from the 918 Spyder hypercar. Under the skin, the new Panamera is set to use the VW Group’s new multi-material MSB platform that will also underpin the next-generation Audi A8 and Bentley Continental range. It should be lighter than at present, thanks to aluminium architecture, and dip under the two-tonne barrier for the first time. All engines will be turbocharged, and will range from smaller-output petrols and diesels (like the firm’s 258bhp 3.0 V6 diesel) to a potent 562bhp bi-turbo V8 from the forthcoming Cayenne Turbo S in the top-spec model. A new version of the plug-in hybrid powertrain will also feature.